On 14 March, Biz Latin Hub received the Australia-Latin America Business Excellence Award in the Small-Medium Enterprise category at the 2019 Australia-Latin America Business Excellence Awards in Sydney, Australia. These awards are recognized by the Australia Latin-America Business Council (ALABC) with support from the Council on Australia Latin America Relations (COALAR). Biz Latin Hub has moved from strength to strength since its conception in 2014. Over four years, the company has finessed its wide-ranging services to foreign businesses looking to enter Latin American markets. But Biz Latin Hub goes beyond addressing the commercial and legal needs of clients; the company also enables businesses to bridge the social and cultural gaps between markets. This quality, customized support has seen Biz Latin Hub rise to become a leader in its field. 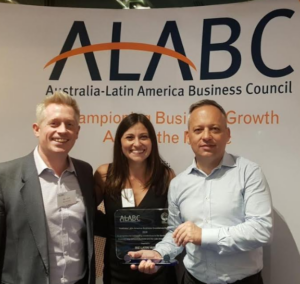 Established in 1989, the ALABC has been connecting businesses across Australia and Latin America for nearly thirty years. Furthermore, the ALABC works with governments to reduce barriers and increase opportunities for foreign businesses. Their ability to empower local economies by forging links between Australian and Latin American companies and sectors has brought longlasting commercial success to these regions. Biz Latin Hub has supported hundreds of businesses to engage with and penetrate Latin American markets. In 2014, Co-Founders Craig Dempsey and David Wright identified a need for quality bilingual market entry and back-office services in Latin America. Together they launched Biz Latin Hub to support foreign companies looking to do business in Latin America. Biz Latin Hub has since supported hundreds of businesses from Australia, North America, Europe, Asia and further afield to engage with and penetrate Latin American markets. These valuable partnerships bring capital, innovation and employment to the region. The company now has a global team of talented staff supporting the success of foreign companies in Latin America. Recently, we opened our Australian office, our first office outside of Latin America. This means we can now help companies expand their presence globally. Our objective is to promote and encourage engagement, collaboration and investment between Latin American and Australian businesses. 2019 is on track to be our biggest year on record. From the Biz Latin Hub team, we thank ALABC for their role in forging business ties between the two regions. Furthermore, we thank our staff, clients and partners – all of whom are central to our success. Our tailored business solutions based on the specific needs of clients has been key to commercial success. Given the diversity of Latin American markets, we understand that a ‘one-size-fits-all’ solution is not possible. We customize our approach to guarantee results for our customers. For more information on Latin American and/or Australian business relations and opportunities, please reach out to the team at Biz Latin Hub via [email protected].